Canopy Garden & Dining Bar is a new-found brunch haunt that offers a good menu of comfort food with friendly price tags, and is coveted for its location – nestled amongst the lush greenery of Bishan Park, and away from the bustling city. I have a thing for calm and unassuming spots as such, where you could just break away from everyone and everything, and idle your day away with your favourite magazine. If you are staying in the area – well, even if you are not, there is absolutely no reason to not pay Canopy a visit. I could preach non-stop about going there for brunch, but let me just highlight its value-for-money offerings. A classic Eggs Benedict – everyone’s favourite and the most common brunch choice – is only $12. While most places in Singapore charge at least $16, and I do think that is rather exorbitant for just eggs, ham and muffin. We got excited after perusing the menu. 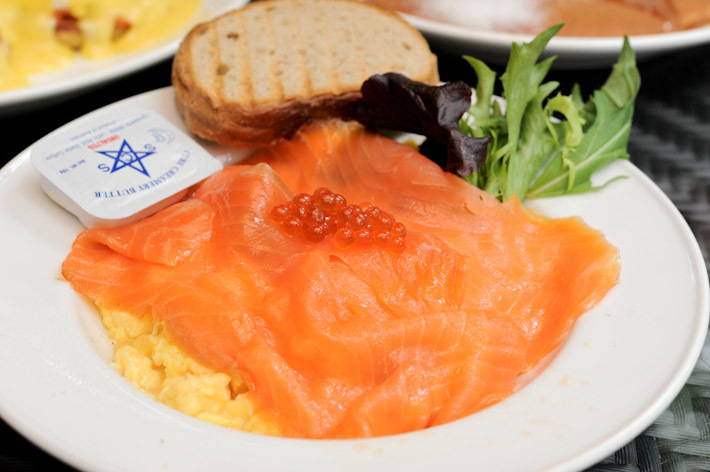 There were so many dishes we wanted to try, but we eventually short-listed three items: Eggs Royale ($13), Buttermilk Pancakes with Syrup ($6) and Scrambled Eggs with Salmon Roe ($12). 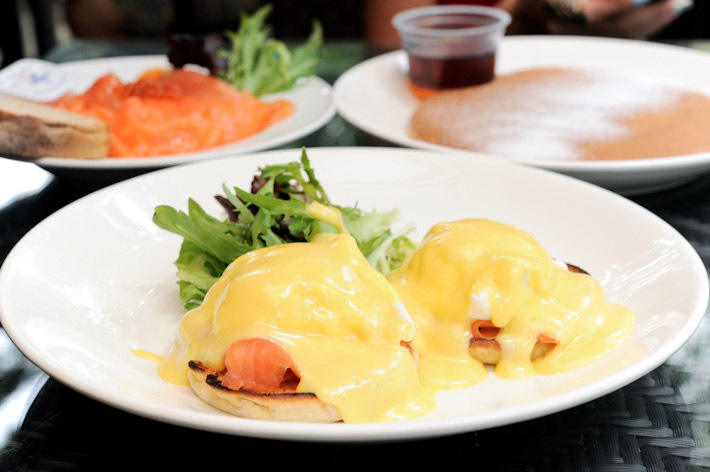 We started with the Eggs Royale, and it far surpassed our expectations with its quality for $13. It was generously covered with hollandaise sauce. This is one vital factor that attributes to the totality of a good Eggs Royale (or Eggs Benedict) – no stinginess when it comes to hollandaise sauce. Then, we had the Buttermilk Pancakes ($6 with maple syrup, and $9 with ice cream). For the price, we thought that it was great value for this dish. 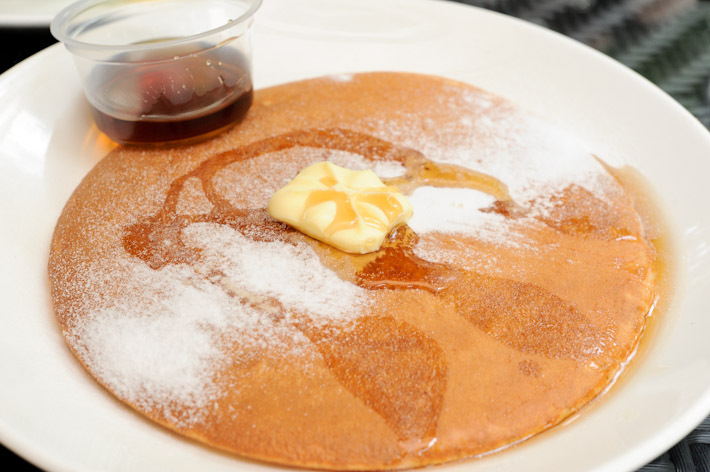 The pancakes were thick and fluffy, but just a heads-up — it could get heavy on the stomach, so order this to share. The last dish of Scrambled Eggs and Salmon was a satisfying finale for our brunch. You can never go wrong with this combination, and here at Canopy, they went a notch up by topping it with the fat and juicy salmon roe. 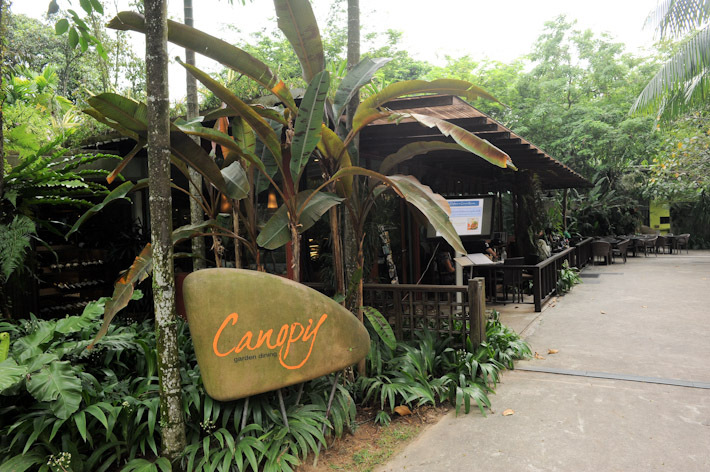 Canopy Cafe at Bishan Park is among the top of my list of brunch places in Singapore, I am sure you will like it too. I just had a bad experience with Canopy. Their service is horrible. 1. I wanted to make a phone reservation… Called three times but no one pick up. 2. Walk in and was left standing outside waited for 3 mins before someone serves us. 3. Ice water are served without coaster. I’m not trying to be fussy here.. But don’t you know water vapor is going to make my table wet? 4. We ordered a hot chocolate and a hot chai vanilla… Drinks order came in 30 MINS AFTER my order. What make things worse.. Both drinks are NOT even HOT.. They are only slightly warm. It feels like drinks prepared are left there for sometime before serving it! 5. We ordered an Egg Benedict and Scramble Eggs with Smoked Salmon… Waited for 45 mins.. Food is not served.. Waited for 55 mins.. Realize other tables who came later than us got served earlier than us! Called a waiter and told the waiter to check our orders as we have waited for almost one hour and other people got served first. Waiter said okay.. We waited for ANOTHER 10 mins.. Not only the food is NOT SERVED, the Waiter did not even follow up on our request. 6. We got really pissed and called another waiter to cancel all our orders and called for bill. Bill came without any apology. Paid for the half drank drinks and seriously with such service I really feel like walking out without paying a single cent bcos I do not think they deserve it. Seriously if the waiting time is so long, they shd inform customer prior their order. Even if they screw up our orders, I would expect a simple apology to be given and to expedite on our request. No follow up, no apology, no info… Just bad service. I’m utterly disappointed with their service. Serves cheap and lousy fries.. Easily soggy fries… Really wouldnt want to recommend people to go there! I’ve been to this place lately, right after having breakfast at Cornerstone (right opposite Canopy). I really wanted to try the food there even though I’ve read very nasty comments about the place prior to my visit. The majority were right.. customer service is non-existent. Those were the exact words my boyfriend and I used. It was a sunday, no doubt, but at 3pm. The place was not even half-filled with patrons, and they do have a good amount of waiters. However, everything was processed slowly. We had to spend some time grabbing the attention of the staff. Food wise, I agree with this post. Prices are reasonable and the standard of the fare was great. I do hope their management do read up online about “news” of them.. and improvise on their service standards.. else it might just put customers off and not return. Went there yesterday. I have heard all the bad reviews from the internet but foolishly decided to give it a try since I stay nearby. And the outcome? I was convinced I should trust the internet. Service was ok but food was horrible! The service was alright during my visit. My partner and I were given a table immediatey, and our orders were taken promptly. Likely because we sat indoor near the kitchen so it was easier to get the service crew’s attention. Or may be they did improve on their service. We wanted to order tortilla chips and wings and watermelon tea(sounds interesting). To our disappointment we were told that they’re out of tortilla chips and watermelon tea. 2 out of 3 items were unavailable! So we decided to give the ‘mussle pot’ a try, and skipped the drink. We ordered the shrimp paste chicken wings and white wine mussles. The food took longer than it should take to come. And it wasn’t piping hot when we were served. But its ok, nothing unbearable. The worst part was the taste of the food itself, it was horrible. One of the worst I’ve ever eaten. The mussles are not fresh and they were overcooked! There was too much liquid there(i expected white wine jus, not a whole pot of soup), and the soup taste horrible. It was so diluted and there wasnt much flavor but it was fishy from the mussle(bcos they were not fresh), and there were some onions and carrots floating, and the alcohol from the white wine wasnt burned off enough, plus the artificial vegetable stock taste(those ready-made cubes) was very obvious even though the soup was diluted. And there’s the wings, not as bad as the mussles but u can taste the frozenness from them(probably those pre-made frozen wings already coated with batter and ready to be fried). We went there at around 6pm so the brunch was over(@5pm), so there was only dinner menu and finger food menu(which is where we ordered from). I find the pricing very steep. We paid $16 for the mussles, it says 350g on the menu, which was exactly 10pcs of mussles. And $6 for 4 pcs of wings(2 drumlets, 2 midwings). The dinner menu items are also sold at almost-fine-dining prices 20++ to almost 40. If I get really good quality food im willing to spend that amount of money, but the quality of food is worse than instant noodles. Not too sure how the main courses will taste like but im not willing to give it a try. Overall, I was just glad that we did not order more than what we did, and that we forgo the drink. Canopy dining on weekday closes at 10pm with last order at 9pm. Not “till late” as written in your blog. My wife and I came here late and filtered to this Middle Rock Garden Bar instead. With so far not friendly customer service. The service is atrocious! I’ve been to Canopy twice and the 3rd time I gave up queuing. The first 2 times I experienced bad and unfriendly service, though I found the food acceptable. The 3rd time I brought my mum there with my dog (not many choices for dog friendly places since we went there for a morning walk) and we were made to wait outside (there were also a few others waiting) with no one coming out to attend to the waiting queue. I am used to waiting (at Grub) or other similar cafes but at least a staff should come out to take down our names or tell us to wait (approx hw long) etc. Finally we gave up when it started drizzling! It is a pity… each time I hesitate to go back because of the bad service experienced! I had a terrific experience today at Canopy garden!! The service was excellent and the food was scrumptuous. I would like to especially commend the service provided by Timothy. He was very polite and attentive throughout the duration of my visit. Even when my son had spilled water all over his shirt, they gave him a new shirt! oh dear, how could you blog this place as one of your brunch favorites??!! really bad service, arrogant stuff AND the food is just acceptable but far from good. Although this place is near to my home, I avoid it now after trying it out 2 times.